Ethisphere announced its 2018 list of World’s Most Ethical Companies today. Corporate compliance officers know what that means — you’re about to get a bunch of ‘Why aren’t WE on this list?? ?” emails from your CEO and board. Ethisphere compiles its World’s Most Ethical list by having companies complete a detailed survey of their ethical values, business practices, corporate governance, and the like. That generates a lot of data worth studying, and eventually Ethisphere will publish a report on that information — but alas, that report isn’t ready today. Instead, Ethisphere also teased us with a few morsels of insight this morning. Honorees have diverse leadership. The median honoree reports that 25 percent of its board or governing authority is comprised of women members, a number considerably above most published studies. One recent study by Credit Suisse found that among 3,000 large global companies, only 15 percent of board members were women. They build trust using transparency into reporting and investigation processes. Nearly all honorees (95 percent) somehow communicate the number and types of reports received, compared to 89 percent in 2016. The number of honorees now sharing this information with employees has more than doubled since 2016 (from 14 percent to 32 percent). That aligns with another Ethisphere finding that organizational justice is poorly viewed across most companies. A common way to fight that is through transparency. More honorees are doing more to measure culture. 2018 WME companies now report using an average of six different methods to measure their culture internally, up from five methods last year. The biggest increase can be seen in the number of companies conducting physical site visits and assessments to measure culture: from 53 percent in 2016 to 81 percent in 2018. 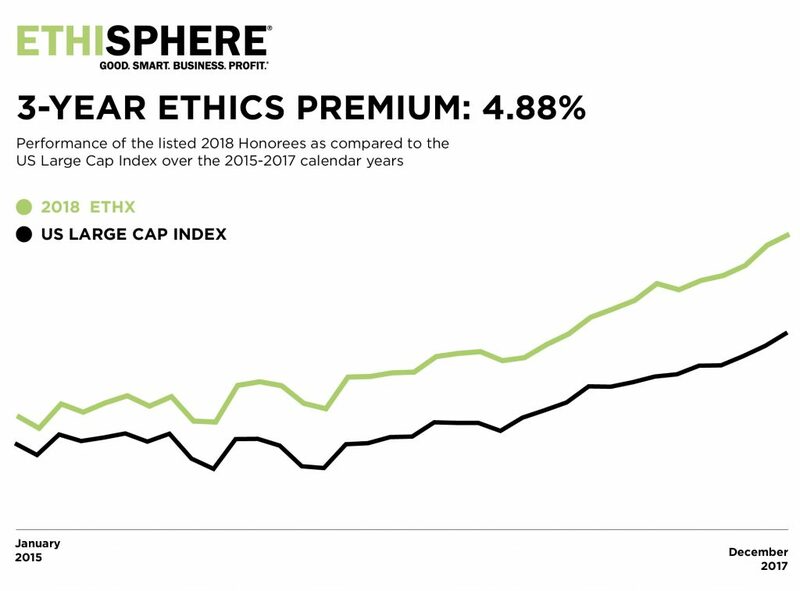 Ethisphere also likes to calculate what it calls “the ethics premium” — the higher stock returns its WME companies enjoy, compared to large companies as a whole. Over the last three years, that premium is about 4.88 percent. I have some theories about why ethical behavior translates into higher stock returns that I’ll explore another day. Suffice to say the premium clearly exists, and it’s not a large leap to reason that companies with strong ethical principles make fewer mistakes, respond to market conditions more quickly, and incur fewer unnecessary expenses (read: legal fees, regulatory settlements, other contingencies). So of course that flow into net earnings, which translates over time into higher share price. And, of course, congratulations to this year’s winners.